Authorities with Homeland Security Investigations responding to an attempted robbery reported at the La Plaza Mall Saturday in McAllen. McALLEN — The presence of multiple off-duty police officers at La Plaza Mall on Saturday likely led to the quick apprehension of seven men who have since been charged with aggravated robbery. 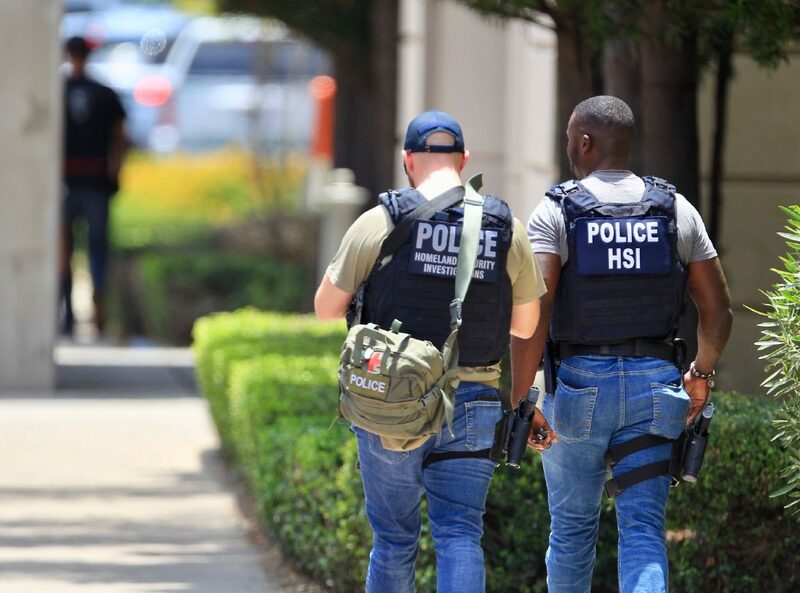 Offense reports released Tuesday by the McAllen Municipal Court detail the minutes after seven masked men stormed into Deutsch & Deutsch, a fine jewelry store specializing in luxury watches, threatening the store’s security guard with a weapon before smashing glass cases with hammers. The sound of breaking glass — paired with the sight of masked men — prompted at least a dozen calls to McAllen police reporting a shooter at the mall, according to offense reports. The first McAllen police officer to the scene was working off-duty security at Express, a clothing store directly across from Deustch & Deutsch. In his police report he wrote that the store’s employees alerted him to “a possible active shooter near the food court” and he “immediately ran toward the area,” at which point a mall patron alerted him to presence of several men in the jewelry store. Within seconds, the officer was assisted by an off-duty Pharr Police narcotics officer, an off-duty McAllen police lieutenant and off-duty McAllen police officer, and together the four detained the seven men and helped secure the scene. The seven men, all Mexican nationals, have been identified as Zepeda Abner Posos, 24; Alberto Rafael Barrera, 32; Brayan Oliver Melchor, 23; Javier Leobardo Olvera-Ramirez, 22; Jorge Angel Rodriguez Mejia, 28; Miguel Quintanilla-Cardenas, 26; and Raul Alberto Rangel-Rivera, 43. All were charged Monday with aggravated robbery, a first-degree felony, and five were additionally charged with a failure to identify misdemeanor, having provided false names and date of births upon their arrests. While McAllen police have reiterated in multiple press releases that Saturday’s robbery had “no use of firearms,” Mejia “had in his possession a black in color gun,” according to a police report, which goes on to state he used it to “intimidate” Deustch & Deutsch’s security guard while the others grabbed jewelry. All of the men were in the country illegally, according to U.S. Customs and Border Protection spokesman Marcelino Medina. At least two of them have carried out similar robberies, with Posos and Melchor pleading no contest to second-degree robbery in Los Angeles County district court following a 2015 armed jewelry store robbery. They, along with eight other individuals, managed to steal 300 designer watches worth more than $4 million before being apprehended by police, according to the Los Angeles County District Attorney’s Office. Posos and Melchor were sentenced to three years in state prison; they were released this past December. The offense reports released by the McAllen Municipal Court also reveal the group likely had a getaway car waiting outside Saturday. A responding officer wrote in his report that he “observed a lot of people running (from the mall) and vehicles driving away” except for a maroon minivan with no front licenses plates parked by the food court entrance with blinking hazard lights. The officer told the driver “to get out of the way,” the report notes. Police discovered the minivan Sunday at an apartment complex two blocks east of La Plaza Mall in the 1900 block of South 8th Street. Dust masks, like those worn by the suspects, were found inside the car, in addition to a luggage bag and backpack; police seized the car for evidence processing. Police were unable to locate the minivan’s driver at the complex, according to the offense reports. The seven men remain in custody at the Hidalgo County Sheriff’s jail on bonds ranging from $200,000 to $210,000.